is a web development framework. We made the manifesto which INTER-Mediator aims for and what it aims at what can be done. "INTER-Mediator e-Learning Course" is offered for you. They are covering from the basic to the advanced topics with lectures and exercises. The language is Japanese and 5,400JPY. You could purchase it from here. Movies for people want to glance at NTER-Mediator are available. These shows the VM to trial and the INTER-Mediator hands-on sessions. The presenter speaks in Japanese. You can start from this page. The fundamental communication between database and web page establishes just declarative way without programming. 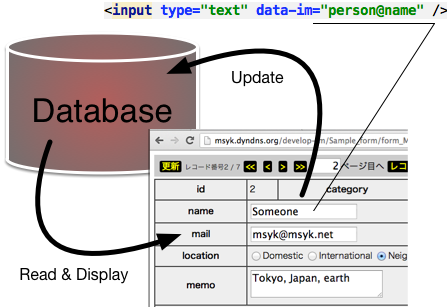 By adding the information about table and field to the text field in a web page, the data from database can be shown on it. Moreover if the data on the text field is updated by a user, it automatically updates to database. It realizes for the most of HTML form elements, and showing and setting to attributes can be to another kind of elements. If the data includes multiple records, it repeats on the web page. The pagination navigation is available just a declaring. The insert and delete buttons can be shown automatically. Images and other kinds of objects can corroborate with database. Authentication and authorization are available with a declarative way without programming. Complex requirements and user interactions can be handled with programming. 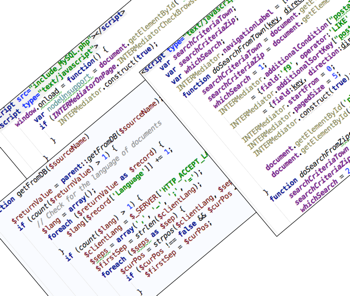 INTER-Mediator has the programming interface, and they realize to manipulate database on both server and client sides. On the server, you can modify the processing for each record or each field with programming, so it doesn't a simple 2-tier system and you can involve domain logic. The browser detection is available and specify the supporting range. The message will be shown when the user uses unsupported browsers. Please see the page of "Download, Installation and the Deployment System". INTER-Mediator is supplied under MIT License.